Limited financial support is available. If you need support, you can add your request on the registration webform with a brief justification. Requests for financial support will have to be made by April 28, 2019. If you would like us to make a hotel reservation for you, please state this on the registration webform. We can only honor requests for hotel reservations made by July 12, 2019. If you would like to make a hotel reservation by yourself you will find a list of hotels here. 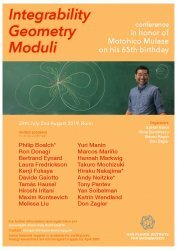 If you have any questions, please feel free to contact moduli19@mpim-bonn.mpg.de.